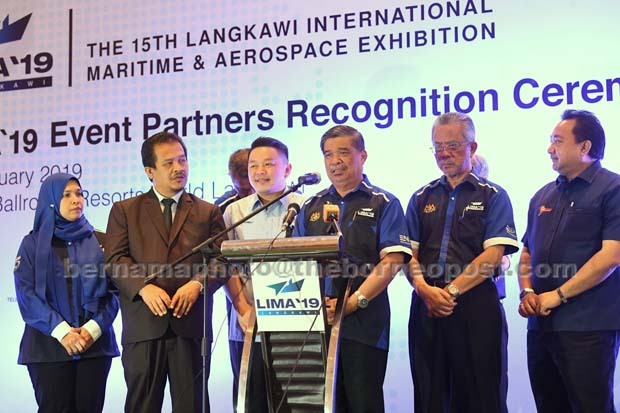 LANGKAWI: A total of 31 nations have confirmed their participation in the Langkawi International Maritime and Aerospace Exhibition 2019 (LIMA’19). “Turkey which is known for its defence industry has the biggest pavilion in LIMA’19, measuring 730 square metres, followed by Russia with 697 square metres,” he said in his speech in a ceremony to recognise LIMA’19 sponsors here yesterday. Commenting further, Mohamad said LIMA’19 was targeting 60 per cent defence and 40 per cent commercial content. “354 local and international defence and commercial companies have confirmed their participation in LIMA’19. This includes 51 per cent or 181 local companies while the remaining 49 per cent or 173 are by international companies,” he said.